However, before you leave and potentially repeat the mistakes of the past, I'd encourage you to keep reading. One of which actually applies to everyone - flash drive user or not. Apparently, many people still don't realize this, but flash memory wears out the more you write to it. How quickly it wears out will depend on the specific flash drive. Like anything, there is a wide range of quality in currently available flash memory-based drives. You can make a rough correlation with the cost of the device, but even that tends to change over time. Depending on usage and quality we could be talking as short as months or as long as several years. I've seen extreme cases of misuse lasting as little as as a few weeks, or on one case even a few hours (holding a Windows swap file). "... flash memory wears out the more you write to it." The tip off for me is that you indicated that it's been working well "for quite some time". Depending on what you're doing with it (i.e. how much you write to it), the quality of the device and just how long "some time" is, I'm willing to bet that the device has reached the end of its useful life. And as you've seen, when they fail they can fail catastrophically. Just one bad bit or sector in the wrong place can render the entire device unrecoverable to anything short of a complete reformat. Not only will a reformat lose all your data, but it may not work, and it appears that you already know that you're living on borrowed time - the device will fail again, and probably very soon. Never, ever, keep anything that's important in only one place; be it a flash drive, a hard drive or a web service. As you can see if that "one place" goes away, so does your important data. Critical data on a single flash drive? You're asking for trouble. Family photos on a single hard disk? Plan on losing them all someday. The obvious solution, of course, is to backup. Naturally, a lot of people get intimidated by that, because backing up seems big and complicated and scary. It doesn't have to be, but even if it is: get over it or risk losing everything you've stored. Backing up can be as simple as making a periodic copy of your data on another device. (Emphasis on the periodic, so that your backup stays up to date.) It can also be as simple as installing and using appropriate backup software. In this case specifically having had a backup could have saved your data. As it is ... I believe you're out of luck. Can a USB thumbdrive "wear out"? While the technology continues to improve, the fact is that flash memory has a limited number of times it can be written to. I can, in fact, wear out. Disk Crash: a backup and recovery story A hard drive died. I review the steps I took, and what finally saved me in the end. There are companies who offer USB data recovery services. It can be done if you're willing to pay enough. I once had a hard disk that died completely and my latest backup was 4 months old. The tech folks at Geek Squad were not able to recover it. But they recommended a local forensic data recovery specialist and he was able to do it, for an exorbitant price, but it was worth it to me. I learned my lesson: back up more often! I can highly recommend this guy (in Vancouver, BC): Simon Feay at Aceon Data Recovery (ace-data-recovery.com). There are others, if you need a place local to where you live. Do a Google search for "USB data recovery" plus the name of the nearest major metropolitan area to you. A personal recommendation is better than finding some random place on the Internet, so ask around. A USB drive is small enough that you could probably mail it to a data recovery specialist. If the data is gone to you anyway, the risk of sending it in the mail might be worth it. Simon Feay is really the best around (at least in Canada). He's the only one West of Toronto who is trained and certified in "white room" techniques. If the flash drive works after a quick format, Recuva can sometimes recover some data. It is free. I wonder if Spinrite would work on flash drive. DO NOT USE SPINRITE ON A FLASH DRIVE. Spinrite is specifically designed to recover and exercise magnetic media like traditional hard drives. In part it does this by writing to it - a lot. It will almost surely trash a marginal flash drive, and seriously shorten the life of a working one. The problem is usually the file system. have been able to recover most if not all the files from a failed flash drive. one caveat -- it will save files as file01.jpg file02.jpg file01.doc file02.doc etc. since its bypassing the file system. better to have to rename files than having no files. another caveat -- there are some files that will not be recovered. I lost a flash drive last week. Luckily I only used it for transfers, copying stuff from on commputer to another from hoe to work and vice versa. I brought it back to the shop and got a new one as it had a 10 yea guarantee. Thet's what surprised me. If they are so vulnerable, how can they have a 10 year guarantee? I think the manufacturer realizes that only 1 person out of a hundred actually keeps the receipts. So reul number 1: never keep fewer than 2 (better 3) copies of your data 2:save receipts. 3: If your data is important (almost always the answer is yes)have an off site back up. I use or have used and recommend Drop Box (2gb) GMail (7.3 gb, email in small encrypted files using Truecrypt) Yahoo mail (unlimited or so they promise) If you need more storage than they offer, open another account. As I said, there's also a wide range of quality in flash memory - so I could see a flash drive lasting 10 years "in normal use". They probably also define "normal use" such that things like dropping your Windows swap file onto the flash drive would probably void said warrenty. 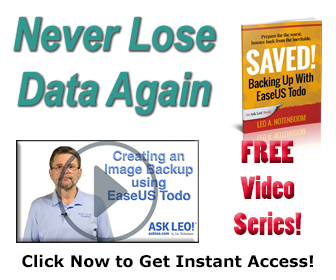 I have recovered all the data from a failed usb drive by using easeuse data recovery. You can download a free copy which will look at your drive and display what it finds. If you can see your stuff the prog can recover it. You will be asked to purchase the prog about $30 but there are a few free versions of it about. No ones mentioned to click on the "Safely Remove Hardware" button in the taskbar before removing your memory stick, it's recommended !! I had a friend who lost all his photos on a memory card. A professional company said it was gone forever. I tried to recover it with PC Inspector Smart Recovery only to be told that the card was unreadable. I then formatted the card and the program was then able to recover all the pictures. Perhaps a reformat before trying a recovery program may be the answer here too. EASEUS data recovery worked perfectly for me also, it recovered a 1TB hard drive (400gb of actual data at the time) i had which was accidentally formatted (quick format). it took overnight to 'scan deleted files' but i got everything back. For a usb device, you could try a QUICK FORMAT and then use a freeware/EASEUS program to 'find deleted files'. if you aren't too technology savvy, try find someone who is to assist.. if the data is that important to you/confidential. A simple way for backing up something really, really critical (say, a book you're writing)? Just e-mail yourself a copy from time to time to an account that uses a different storage location (say, online, or to your work e-mail address). You can even set up a rule wizard there to keep those e-mails in a separate folder so you can quickly search back thru them if ever needed. It's not a good solution for whole-computer backups, but it works great if you do that with family photos as you take them, or with something like a thesis or book. Computer service techs have known about this for as long as the drives have been available. They always keep a spare duplicate drive in the bag for when they plug in only to discover the USB front port was wired backwards... snap, crackle and pop! I have yet to see a CD or DVD turn bad once it has been verified, and for this reason, I backup very very very important data on them TWICE. Such data is not usually bulky and so few disc's are required.I still use CD's nearly 15 years old, over and over and over with no problems at all. Of course they can get lost, but whose fault is that? Just to comment to Mike: Oh yes, CDs and DVDs DO turn bad. In tropical climate, they work for two years or so if you burn them yourself. Professional CDs (e.g. music cds you buy) work for much longer. - Especially: Never use Rewritable CDs in tropical climate, they develop weird pathways (looking like termite paths) on themselves and gone with the wind are your data (lifespan: app. 6 months). I can only agree with Leo: Backup, backup, backup! There is no 100% safe solution (even printed paper can be eaten by termites). And by the way: I do not have time to back up my 40 GBs of data on CDs, really! Since I started using the boot manager OSL2000, if I leave a Fat-formatted flash drive in the system at boot, it is hidden. Windows sees this as unformatted. I use Acronis Disk Doctor to unhide the drive, and everything is back. Maybe something is hiding your drive. Piriform (CCleaner authors) offer a sweet little recovery tool for deleted & misplaced files called, Recuva. I have used it to reclaim images from various flash drives with great success. I had the same situation around a year ago. My FlashDirve suddenly stopped reading and writing data. Nevertheless, all PCs with Windows XP or Linux installed on them recognized my FlashDrive successfully. As I investigated in a time, this is a pretty frequent problem. Usually when this happens Hard Disk Drive, installed in your FlashDrive is still functioning, but, for some reason, power controlling chip destroying. This chip is placed inside of the Flash-Drive plastic box. It gets the power from USB cable and correlates it to the value, used by HDD. When power controlling chip destroys it stops to power HDD, and as a result, your data makes inaccessible. You can go to one of the professional PC repairing companies and talk to their engineers to help you to unearth the HDD from FlashDrive and connect it to your motherboard as an additional HDD drive. They could tell you that additional attuning device is needed to do this. Yes, in some cases it requires, but this device costs less then five dollars. And last comment: Yes, when you un-mount FlashDrive, it will be destroyed, but you have at least a chance to restore your priceless data. If you want to know the story how I restored my data, please e-mail me [email address removed] and I�ll tell you. I need help. I haave a flash srive that has locked up witout my consent. I was using it and there was an error and when I checked the USB drive again there was anew folder in it which apparently had been run by chksum which found errors and saved the fragments in to this folder. and then, without asking, locked the drive now I can't write to it or get rid of the lock. Obviously I was never asked for a password. I'd be willing to re-formaat but that also doesn't work. So, how do I clear this lock so that I can use the USB drive again??? Re "flash drives wear out". Does this mean that the future of computers with solid state hard drives is bleak? As I mentioned in the article, there's a wide variety in terms of cost and quality. Solid state drives tend to be expensive in part because they use a higher quality technology that lasts longer. The media will still wear out if used long enough, but as long as the media outlasts your need for it (i.e. it lasts longer than you keep the computer, for example), then all should be well. The issue is that many people don't realize how quickly inexpensive flash drives can fail if used improperly. Everything will wear out eventually. The 10 year guarantee refers to "how long the flash drive will remember your data"
ie after 10 years the data "fades away"
before 10 years is up, you should re-write or refresh your data. THe maximun number of writes mentioned is a seperate problem. THat the data is only gauranteed to be remembered for 10 years is a little know problem of flash drives. Just one thing I remember reading and thought I should share.. apparently it is not a good idea to defrag any flash drive as this tends to ear the drive out even faster. This seems to make sense to me, but I would like to know if it is true or not. You probably read it here: Should I defragment my USB Flash drive? - and you're correct, it will wear it out much faster. Format your falsh drive. Don't opt for quick format otherwise your problem ill not solve. When you format your flash drive, flash drive will work properly now. Now the turn is to recover the data from it. Use Memory card recovery software which easily recover lost data from memory card. I have just had an 8GB USB drive suddenly not show the files and folders, although a check of properties showed that the data was still there but was not able to be read. I definitely did not delete or overwrite the data. I spent hours trying to find a free program that would fix the problem but failed. Some programs, (I suspect that "Memory Card Recovery" is similar) actually found the data but then, after alleging that they were free, said I had to pay to actually recover the data. I ran a full Check Disk to see if that would help and WOW!!! it sure did. I now have my data back which I am currently transfering to another place. I will then do a full reformat of the USB drive, and will never, never, never ever put important data again only in the one place. I'm having that 'format me' problem now. I tried at least 6 recovery programs with no success. CHKDSK /f doesn't work and complains RAW format drives are not supported by it. The closest I came was to use a recovery pgm and see a few files on it, but without the directory structure. I'm DLing the MEMORY RECOVER pgm above though it is a 'pay to fix' pgm. Any new free programs to help? A little program called DiskDigger is amazing. I was using a two gig flash drive and it stopped working. My computer won't recognize it when plugged in yet certain utility programs such as WinUtilities will. There are some important data and pictures on the drive I would like to retrieve so is there a free/pay program I can use to retrieve it, or is it just a lost cause?